The UK Soil Observatory (UKSO), launched today in London, is a ‘big data’ initiative that provides a portal for unified UK soils data and information. Until recently soils data, knowledge and expertise was scattered across a wide range of institutions. UKSO will give improved access to data and information including fully described data sets, analytical tools and analyses allowing users to access information for novel research, for public and private decision making and for general interest groups. The UKSO has a specific objective of providing these data for free where possible. Knowledge of soil type and properties is key to improving management practices to develop sustainable agricultural production, helping to maintain the UK’s carbon balance and such knowledge is relevant to understanding a wide range of ecosystem services. Soils and the land surface are where most business and industries interact with the environment: soils underpin the UK’s £172bn/year food and drink chain (3.7 million jobs), and drive UK growth in areas such as the new bio-economies, worth 1.5 trillion Euros in the EU alone. Soils contribute to the delivery of many ecosystem services, yet they are readily degraded and it is important that better methods are developed to conserve and improve this vital resource. Soils are also vital to many business sectors from agriculture and food production to construction, insurance and health. 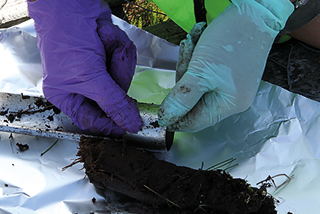 The UK already has some of the most detailed and extensive soils data sets globally. However until now these have been disparate and hard to access. UKSO will dramatically improve this situation: it is a web-based platform that both showcase and enables access to many different data sets. All data are required to be INSPIRE compliant to maximise their use and reuse in many different analyses. One USKO objective is to have free access to these data for non-profit making use of the data and to facilitate commercial use for wealth creation. The project will acquire new data, harmonise licensing, develop access software, and ensure data interoperability to improve the clarity and ease-of-use within the portal architecture. Partners in the UKSO include the Centre for Ecology & Hydrology, the British Geological Survey, Cranfield University, the James Hutton Institute, Forest Research and Rothamsted Research. NERC are providing much of the funding for UKSO.